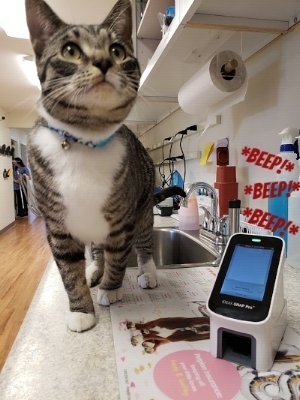 Hi there, Maverick the clinic kitty here for another important message from yours truly. I pick up a lot of great things around this place aside from chin scratches - I get to learn about all kinds of neat stuff! You may think I'm just playing with a mouse from underneath a closed door, but I'm also listening in on the conversations and learning as much as I can. You should be calling me Dr. Maverick from now on! It's a mostly known fact that dogs and I still don't have the best of relationships, but I'm getting better about it. With that said, I do want my canine friends to be happy and healthy so they can chase the other cats, just not me. My favorite internet blogger slaved away for hours writing a new blog a few weeks ago about these nasty things called heartworms. I want to make sure that everyone knows how gross they are, as well as how preventable they are! Jar of not spaghetti - those are heartworms! One of the biggest ways to keep these squirmy worms from invading your dog's heart and lungs is by keeping them on a heartworm preventative, but I'm sure you already knew that because you're all so smart! Another way to help with your fight against heartworm invaders is by bringing your pooch in for a yearly heartworm test which takes very little time! Also, can you imagine worms inside your heart? Eeeww! "But Dr. Maverick... if my dog is on a preventative year round, why do they need to be tested?" I'm so glad you asked! Even if your dog has their heartworm treat every month, they should still be tested! I know that sometimes people forget to give their treatment on the same day each month and can be a few days late. It happens, just like how I sometimes don't get fed at the exact same time every day, not that I'm trying to make my staff feel guilty or anything. Humans aren't as perfect as me and I forgive them for it. Or maybe a dog is feeling particularly sneaky that day and might spit out their heartworm treat without their mom or dad knowing and hide it under the couch. (It's something I would do. I'm a cat - I'm not ashamed.) And I've also heard that sometimes, dogs can make piggies of themselves and eat all their food PLUS the cat's food (so rude!) and then when they're given their heartworm treat, they just can't hold anything else in their stomach and they throw it up. (Dogs are weird, what can I say?) It's also possible that the heartworm treat they're given isn't quite strong enough too and won't keep baby worms from growing. "Dr. Maverick, heartworm testing seems kinda scary. Is it scary?" Me looking dapper next to one of our heartworm test machines. Can you make this stop beeping, please? Heartworm testing isn't scary at all! Your dog might act like it's scary, but trust me, it's just a game your dog is playing so he can go to the dog park instead of coming here to see me. Heartworm tests are just a blood test. A technician will take a teeny bit of blood and put it into a machine that makes a lot of funny noises, then it snaps really loud to let you know that it's thinking. It'll think for about eight minutes until it yells at you with this high pitched beeping sound to let you know the test is over and the results are ready! Fireworks, Thunderstorms, and Anxiety - Oh My!